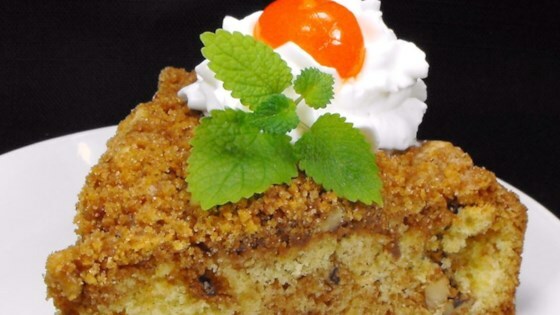 "A graham cracker and nut streusel swirls through this quick, cake mix fix-up. Our family has been making and enjoying this delicious cake for many years. This is wonderful with a cup of hot tea!" Preheat oven to 350 degrees F (175 degrees C). Grease a 9x13 inch pan. Make the streusel: In a medium bowl, combine the graham cracker crumbs, nuts, brown sugar and cinnamon. Stir in the melted butter. Set aside. In a large mixing bowl, combine the cake mix, water, oil, and eggs. Beat on low speed with an electric mixer just until moistened. Beat on medium speed for 2 minutes longer. Spread 1/2 of the batter into a greased 9x13 inch pan. Sprinkle on 1/2 of the streusel mixture. Carefully spread the remaining 1/2 of the cake batter over the streusel, and sprinkle with the remaining streusel. Bake for 35 to 40 minutes or until a toothpick inserted comes out clean. Cool slightly, then drizzle with the powdered sugar icing. Best if served warm. Makes 12 to 16 servings. To make the Icing: In a small bowl, combine confectioners sugar with vanilla and butter flavoring. Add a few drops of water until you achieve drizzling consistency. I love this cake! I made it in a bundt pan and drizzled icing over it while still warm. Very nice presentation for our Father's Day dessert get together. Everyone loved it! Thanks! This is an easy-to-make, excellent cake. This recipe was great. I don't like nuts so I changed it a bit... instead of the walnuts I used 1/2 cup rolled oats and increased the butter to a full cup. It was delicious!